At Questionmark we are all about our customers. Through case studies and the US and European users conferences we listen to your stories and experiences and learn how to shape our product to suit your needs. 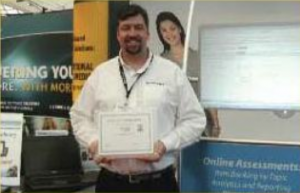 2011 Best of Elearning! Awards, based on nominations by the readers of Elearning! and Government Elearning! publications, cover 26 categories of enterprise learning solutions and workplace technology products and services. We are very pleased to be winners in the “Best Assessment Tool” category We’ve been recognized in this award program since 2007. The 2011LearnX Asia Pacific E-Learning & Training Awards were decided by an independent panel of judges. We are honored to have been awarded the platinum award for Best in Class Technologies – “Best Assessment Tool” — our fourth from LearnX! Our customers’ suggestions and support have made all this possible – so we thank you!